Turmeric, Curcuma longa, is a plant closely related to ginger that is native to South Asia. Like ginger, turmeric’s root contains the majority of its healthful properties. This root has been used for thousands of years as a prized ingredient both in cooking and as an herbal medicine. If you cut into the turmeric root, a bright yellow-orange color will be revealed. A spice used in many Asian, Indian, Middle Eastern and North African dishes, turmeric is an ingredient in most curries and mustards. Imparting a vibrant yellow-orange color to anything it touches, turmeric’s taste profile is unique, featuring a combination of peppery, warm and bitter flavors. In addition, turmeric’s aroma is typically regarded as sweet and pleasant with a likening to orange zest and ginger. After being harvested, turmeric root is boiled, dried and ground into a bright yellow powder. Considering all of these valuable ingredients, it is no surprise that turmeric has been a staple in the Traditional Chinese and Ayuverdic herbal traditions for centuries. In the past couple of decades, turmeric has also secured a prominent role in Western herbalism. The research conducted on turmeric root extract is so conclusive for an array of health conditions that many Western medical practitioners have started advising their patients to supplement with turmeric. Dating back to 250 BC, Susruta’s Ayurvedic Compendium recommends an ointment containing turmeric to relieve the effects of poisoned food. In 500 BC, turmeric emerged as an important part of Ayurvedic medicine. In the 1920s, German scientists began to study turmeric’s therapeutic properties and concluded it contained bile-stimulating effects. 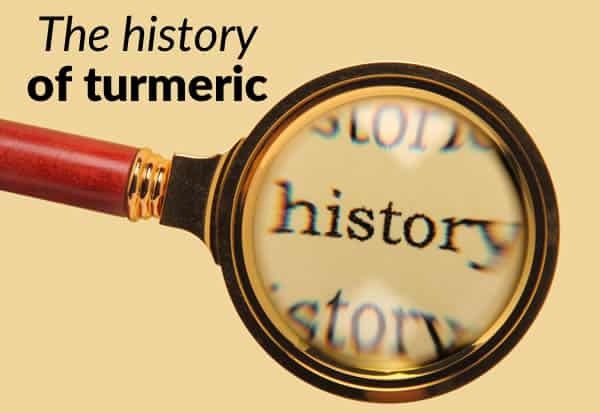 In 1985, the German Commission E approved turmeric for the internal treatment of indigestion. Studies done in 1971 and 1991 show that Curcuma longa has anti-inflammatory effects that surpass hydrocortisone. In the early 1990s a group of prominent Western herbalists (including Murray, Hobbs, Castleman, Mowrey, Duke, Clark, Tierra, and Pederson), began touting the use of turmeric for several major health problems, including poor liver function, digestive problems, cancer prevention, and menstrual irregularities. Modern medicine has increasingly recognized turmeric’s value to human health, as indicated by over 3,000 publications addressing turmeric that came out within the last 25 years. Curcumin is the substance that yields turmeric’s colorful pigmentation. In general, turmeric contains between 3% and 5% of the active ingredient curcumin. 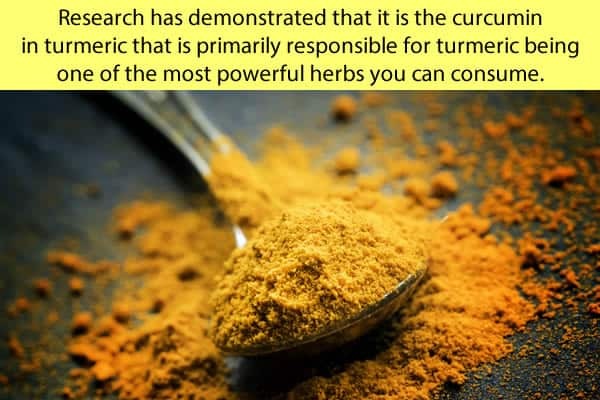 Research has demonstrated that it is the curcumin in turmeric that is primarily responsible for turmeric being one of the most powerful herbs you can consume. Of great value to our health, curcumin is known for its anti-inflammatory, bile-stimulating, anti-tumor, anti-arthritic, anti-amyloid, anti-ischemic, anti-microbial and carminative (reduces flatulence) properties. Alzheimer’s Disease – In addition to having anti-amyloid properties to prevent plaque formation in the brain, curcumin can increase brain levels of BDNF (brain-derived neurotropic factor), a growth hormone that is often low in those with Alzheimer’s. Heart Disease – Curcumin improves the function of the endothelium – the lining of the blood vessels. In addition, curcumin reduces inflammation and oxidation, which are major factors in lowering heart disease risk. Liver Disease – Because it improves bile flow and reduces cellular inflammation, curcumin holds great value to those with liver issues. Arthritis – Arthritis is characterized by joint inflammation. Curcumin targets multiple steps in the inflammatory pathway at the molecular level. This includes blocking NF-kB, which is believed to play a major role in many chronic inflammatory diseases. Cancer – Research done by the Life Extension Foundation found that curcumin targets 10 factors that contribute to cancer development, including chronic inflammation, DNA damage and disruption of cell signaling pathways. 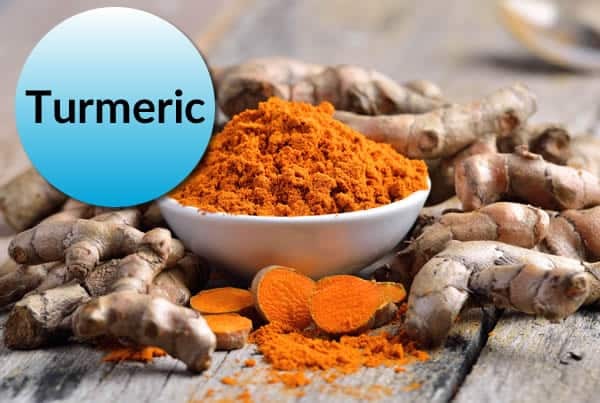 Peptic Ulcer and Other Digestive Disorders – Curcumin’s potent anti-inflammatory and carminative effects are likely responsible for its value to the digestive system. Elevated Blood Sugar Levels – Curcumin modulates blood sugar and improves insulin receptor function by improving its binding capacity to sugar. As stated above and supported by decades of research, turmeric’s value to human health is wide spread and irrefutable. Turmeric is most commonly known for its ability to decrease inflammation throughout the body which protects against so many serious health conditions. However the research has also proven that turmeric supports a healthy aging process, and does so much more than reducing inflammation when protecting many different parts of the body – including nearly every aspect of your liver’s health. Your liver is your body’s largest glandular organ, and it performs many essential functions to maintain life. With a prominent role in detoxification, digestion, metabolism, immunity and the storage of nutrients in the body, the liver is one of your body’s most valuable components. Fat Metabolism – The liver produces bile, a substance needed to digest fats and aid in their absorption. Bile’s salts break up fat into smaller pieces so it can be absorbed more easily in the small intestine. Blood Detoxification – The liver detoxifies your blood to rid it of harmful substances such as cellular waste, toxic byproducts, bacteria, chemicals, heavy metals, alcohol and drugs. Storage Facility – The liver stores glycogen, vitamins and iron so there is a supply when needed. When blood sugar levels drop and your body needs energy quickly, the liver converts the stored glycogen into glucose and releases it into your bloodstream for a rapid burst of energy. Manufacturing – The liver manufactures many essential proteins, including enzymes, hormones, blood proteins, clotting factors and immune compounds. These proteins are needed for transporting substances in your blood, aiding in blood clotting and providing immune cells with the ability to resist infection. Cholesterol Coordinator – Cholesterol is a waxy substance needed to make hormones and assist with many body functions. The liver produces cholesterol, excretes it and converts it to other essential substances. The antioxidant and anti-inflammatory properties of turmeric have a healthful impact on several of the liver functions listed above. Research on turmeric has found that supplementing with turmeric has enormous benefits for supporting healthy fat metabolism, aiding your liver in detoxification, and maintaining a favorable cholesterol balance in your blood. 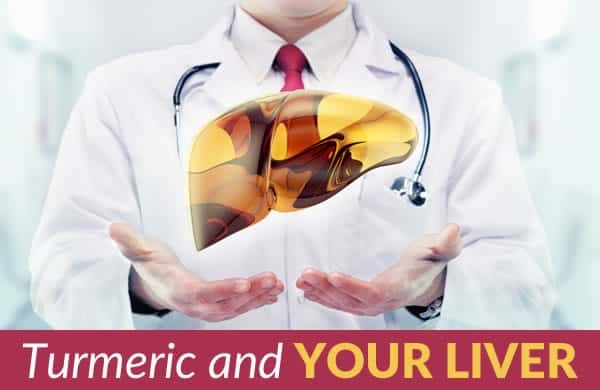 Turmeric supplementation has also been shown to reduce your risk of fatty liver disease by stimulating bile and regulating the enzymes responsible for cholesterol metabolism. Since excessive fat accumulation in the liver is estimated to affect approximately one-third of all American adults and is known to accelerate the progression of any type of liver ailment, turmeric offers a simple solution for a fatty liver and prevention from possible future, more severe liver damage. Stimulates Bile – Curcumin in turmeric stimulates bile production and flow, helping to metabolize and eliminate fat. Regulates Fat Metabolism – Curcumin in turmeric helps regulate fat metabolism by affecting glycerophospholipid metabolism, glycerolipid metabolism, and steroid hormone biosynthesis signaling pathways. Prevents Liver Cell Damage – Due to its antioxidant and anti-inflammatory activity, curcumin decreases the amount of free radicals that encourage liver damage and fibrosis. Free radicals are highly reactive, unstable molecules with an unpaired number of electrons that can damage cells and tissues. 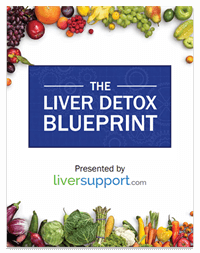 By preventing liver damage, there are more functioning liver cells to detoxify, manufacture, store, and metabolize. Kills Liver Stellate Cells – Turmeric’s active ingredient aids in the selective demise of harmful cells. More specifically, curcumin activates apoptosis (programmed cell death) in the liver stellate cells that cause liver fibrosis. Increases Glutathione – Curcumin reduces oxidative stress by increasing the amounts of glutathione in the cells. Glutathione is a compound that combats reactive oxygen species (particles that injure cells) in the tissues, preventing them from causing damage. An additional liver benefit of turmeric is an unexpected bonus. We all know that the mind and body are intricately entwined, that stress has the ability to cause physical health issues such as headaches, muscle pain and fatigue. 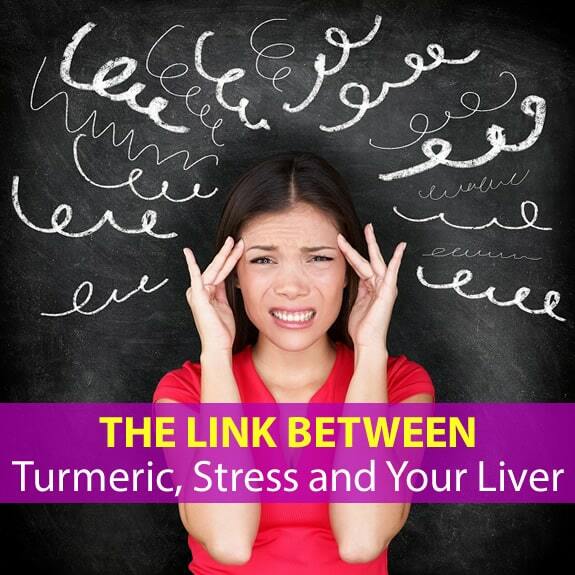 But did you know that stress can also negatively impact your liver’s well being? During stress, natural killer cells (NKT) are expanded in the liver and contribute to liver cell death and the worsening of liver disease. Stress can also impair blood flow to the liver and exacerbate liver inflammation. 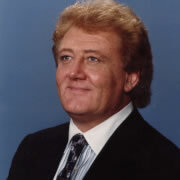 Thus, anyone with liver issues is at additional risk for more liver damage when under substantial, unrelenting stress. Researchers have found that curcumin enhances brain chemicals such as noradrenalin and serotonin, and increases the production of dopamine, helping to reduce stress levels. These chemicals that normally exist in your body are known mood elevators capable of easing stress. In addition, curcumin has been found to lower cortisol levels (cortisol is known as the stress hormone). As such, curcumin’s enhancement of your body’s natural mood elevating compounds and reduction in cortisol has an indirect, yet positive effect on your liver via stress reduction. So, on the whole, turmeric is a highly valuable herb to supplement with to maintain or improve your liver health. Turmeric’s antioxidant and anti-inflammatory properties, its ability to improve several key and essential liver function, such as detoxification and fat metabolism, its ability to protect liver cells from damage, reduce fat accumulation, improve fat metabolism and shield your liver from the effects of stress make it a supplement that should be made a part of everyone’s dietary plan. Considering it’s a common spice that might already be lingering in your kitchen pantry, what is the best turmeric for your liver’s health? Adding turmeric to your stir-fry is a step in the right direction, but sprinkling some of this yellow-pigmented spice on your veggies is likely not enough to improve the health of your liver. That’s because an awful lot of turmeric is needed to yield a therapeutic dose of curcumin, the component of turmeric primarily responsible for all its health benefits. Because of curcumin’s potential to reduce liver inflammation, support optimal liver function and improve the liver’s fat metabolism, many consider taking a turmeric supplement to benefit from its therapeutic properties. Experts believe that turmeric contains between 3% and 5% curcumin. Since the ‘magic’ of turmeric is found in its curcumin content, the percentage of curcumin or curcuminoids in your chosen turmeric supplement is essential to determining its potential effectiveness. High quality turmeric supplements are standardized to contain a specific dosage and concentration of curcuminoids. Such supplements contain a significantly higher dosage of curcumin extract than non-standardized turmeric supplements. The most potent and powerful turmeric supplement available contains a 95% concentration of curcuminoids. This is what you should look for. As for quantity, although different sources assign differing quantities of curcumin to achieve therapeutic value, most agree that a threshold of effectiveness is crossed once you take 500 mg of curcumin a day. Curcumin, while being a potent antioxidant and liver supportive supplement, has poor oral bioavailability. This means that a low percentage of what is consumed is actually absorbed into your bloodstream and able to reach its target in your liver. Unfortunately, the curcuminoids are excreted as waste before they are able to impact your body. Since neither turmeric nor curcumin easily enters your bloodstream, its bioavailability must be boosted to achieve therapeutic value. In order to help curcumionoids enter your bloodstream, it must be combined with a type of catalyst. Piperine, also referred to by its trademarked name, BioPerine, is such a catalyst. It is used as a “bioenhancement,” because it accelerates the absorption of nutrients, such as curcumin. Piperine is an extract derived from black pepper, Piper Nigrum L, and long pepper, Piper longum L. Piperine is the component that lends peppers a spicy taste. Through research, BioPerine was shown to increase the absorption of a variety of nutrients, including curcumin. All four of these BioPerine properties function to keep curcumin in your body’s cells longer. As found in a study published in Planta Med in 1998, researchers determined that combining curcumin with BioPerine can increase the absorption of curcumin by up to 2,000%! That’s 20x that of curcumin alone. Awareness of curcumin’s value to liver wellness is growing steadily, and with that awareness is a spike in the market for turmeric supplements. Because turmeric’s star component, curcumin, is so useful for reducing liver inflammation, improving liver fat metabolism and supporting liver function, turmeric supplementation is becoming common knowledge in those with liver concerns. 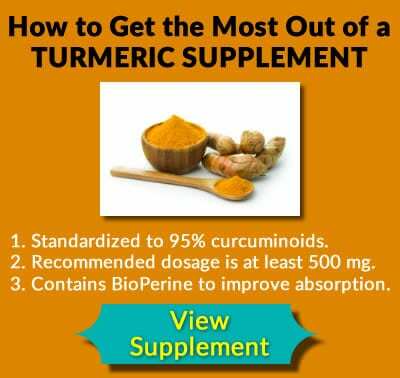 To get the most out of a turmeric supplement, make sure that it is standardized to 95% curcuminoids, its recommended dosage is at least 500 mg, and is paired with BioPerine. Every conventional medication has side effects, some more severe than others. While most people believe herbs and supplements to be free of side effects because they are natural, this is not always the case. Turmeric’s strong anti-inflammatory and antioxidant properties make it a potent ally for cardiovascular, liver, joint, immune, metabolic, neurologic and digestive health. When any substance – whether manufactured or found in nature – is as strong as turmeric, there are bound to be some cautions regarding its use. Turmeric’s therapeutic characteristics can help a great deal of people, but those same properties may cause side effects in certain individuals. Consuming turmeric in food rarely causes any side effects, but larger dosages may. According to the National Institutes of Health, standard supplement dosing of turmeric is between 400 milligrams to 3 grams divided over the course of a day. In tea form, 1 to 1.5 grams of dried turmeric root once or twice a day is a standard dose. Gallstones or Bile Duct Obstruction – Turmeric stimulates gallbladder contraction, which aids in preventing gallstone formation. However, those who already have gallstones or a bile duct obstruction can experience pain and spasms when supplementing with turmeric. Bleeding Disorder – Turmeric has blood-thinning properties, a feature that helps reduce inflammation in the body. However, those who have a blood clotting disorder or who are already on anticoagulant or anti-platelet medications are at risk of excessive bleeding if taking large amounts of turmeric. In addition, those who are getting ready to undergo any type of surgery are advised to stop taking turmeric two weeks prior to the procedure to avoid unwanted bleeding. Diabetes or Hypoglycemia – Turmeric helps lower blood sugar, a benefit to those hoping to prevent metabolic syndrome or insulin resistance. However, this blood sugar-lowering property may increase the effects of diabetes medications and result in blood sugar levels that are too low. Reflux – Turmeric’s anti-inflammatory properties and stimulation of gastric acid make it valuable for many types of digestive system discomforts. However, high dosages of turmeric may cause stomach-related side effects such as pain, nausea, diarrhea, indigestion and gas – especially in those with gastrointestinal reflux disease (GERD). Pregnancy – Turmeric may help facilitate uterine contractions, a benefit for those suffering with PMS that find relief from menstrual flow encouragement. However, the possibility of turmeric stimulating uterine contractions means that pregnant women should avoid it. Blood-Thinning Medications – Because turmeric may potentiate blood-thinning medications, use caution if taking with warfarin (Coumadin), clopidogrel (Plavix), aspirin, diclofenac (Voltaren, Cataflam), ibuprofen (Advil, Motrin, others), naproxen (Anaprox, Naprosyn), dalteparin (Fragmin), enoxaparin (Lovenox), and heparin. Stomach Acid Reducers – Because it increases the production of stomach acid, turmeric may interfere with the action of Cimetidine (Tagamet), Famotidine (Pepcid), Ranitidine (Zantac), Esomeprazole (Nexium), Omeprazole (Prilosec) and Lansoprazole (Prevacid). Diabetes Drugs – Because turmeric may potentiate blood sugar lowering medications, turmeric may make the effects of these drugs stronger, increasing the risk of hypoglycemia (low blood sugar). Common diabetes medications include: glimepiride (Amaryl), glyburide (DiaBeta, Glynase PresTab, Micronase), pioglitazone (Actos), insulin, glipizide (Glucotrol), tolbutamine (Orinase), rosiglitazone (Avandia) and chlorpropamide (Diabinese). Just like with all substances, turmeric may cause allergic reactions. People with allergies to plants in the ginger family and those with an allergy to yellow food coloring (often derived from turmeric), are most susceptible.